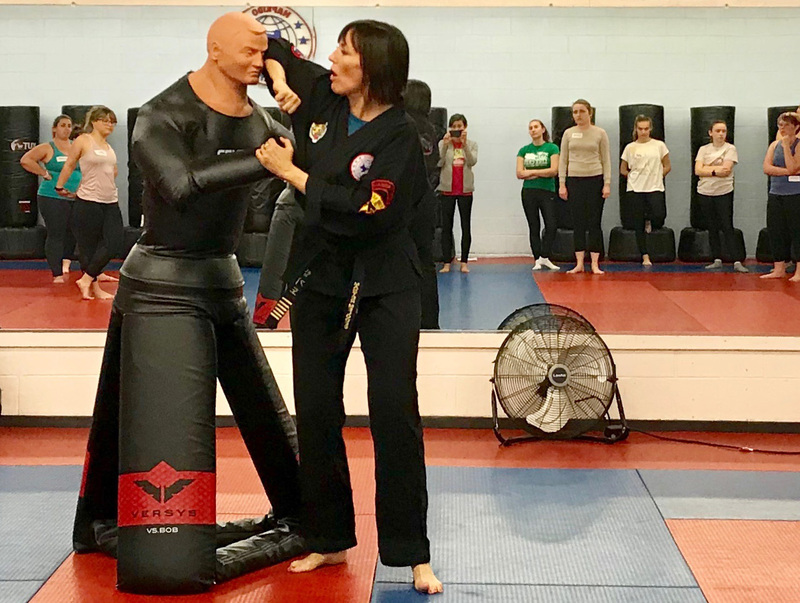 Photo: Courtesy Sixth-degree black belt Melodee “Mel” Meyer teaches women to face danger proactively in her women’s self-defense workshop at Martial Arts Family Fitness. Above, she demonstrates an elbow attack on Bob the dummy. The practice room was lit with bright fluorescent lights and lined with soft rubber mats, which lent a faint scent to the space. I was there with 19 other women for the free class, and we formed a circle around Master Mel, as she’s called, as she explained how this spot at the base of the neck is even more accessible than the groin, the other target that often first comes to mind when women think about defending themselves from a male attacker. “I love working with women because they know how to hold a safe space for each other to learn in,” said Meyer, who is a sixth-degree black belt. But enough talk — it was time for some action! Meyer asked us to pair off to practice defense maneuvers along a row of kickboxing bags lining one side of the room. It may sound counterintuitive, but when you’re being threatened, attacking first is often the best way to put an end to a dangerous situation. Identifying and attacking soft targets such as the perpetrator’s nose, eyes, and suprasternal notch could be the difference between life and serious injury or even death. She taught us that some parts of the body that make great weapons are elbows, fingers, feet, and legs, but not usually fists. “Be proactive, not reactive, because you’re going to end it,” Meyer said as we stood facing each other in two long lines, and a trickle of sweat leaked onto my brow line. We practiced escape maneuvers, including various wrist-grabs and being held from behind. And we unleashed knee attacks on Bob, our willing attacker dummy. Much like a hunk of rubber does, he took his lumps without complaint. As we practiced, Master Mel’s voice cut through the pummeling noises with strategic tips on minimizing our risk of being targeted and building our situational awareness. My favorite part came near the end of the workshop, when participants shared some of their personal experiences with violence, reflecting on the lessons they had learned in the course. “It was cool to learn how you can look like a victim, or not,” one participant said. Another woman remarked that she didn’t realize how important making eye contact was in facing down potential threats, and that it was going to be something she’d work on. Master Mel shared her friend’s story of using the maneuvers we practiced to successfully defend herself when an Uber driver attacked her. “She’s a boss,” a teenager said in response to the story. It was a sentiment affirmed loudly by the rest of the group.